I bought a couple of IXYS linear MOSFETs (IXTK90N25L2) a while ago to test their capabilities when used as electronic load, and the result was quite impressive. So I decided to build another electronic load using both MOSFETs. As you can see in the video towards the end, this electronic load can sink more than 100 Amps of current while dissipating more than 400W continuously and can withstand more than 1kW of power dissipation in pulsed operation mode. The circuit is almost identical to the one I used in my previous experiments. Instead of using a single MOSFET, two MOSFETs are used. Each channel is identical. 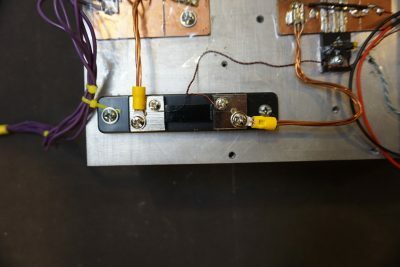 When the voltage control inputs and the drains of the MOSFETs are tied together, the load is essentially divided equally between the two MOSFETs. I used two 50A/75mV current shunt resistors as the feedback resistors. The obvious benefit in choosing such small resistance value (each shunt is only 1.5mΩ) is that the voltage drop is virtually negligible. Even when handling an 100A load, the voltage drop across each shunt resistor is only going to be 75mV. The downside of using such low valued shunt resistors is that it requires the opamps to have extremely low input offsets as even a small offset can introduce a large error in controlled drain-to-source current. For instance for my particular setup, a 100µV offset voltage would cause a 133mA change in the load current. Also, it is difficult to generate such low and stable control voltages without using precision DACs and precision opamps. My intention was to use this electronic load with my Krohn-Hite MV216A voltage standard so generating a low and stable control voltage is not an issue (MV216A has a voltage resolution of 0.1µV in the mV range). If you plan to use a microcontroller to control the load like I did in my previous electronic load build, you will need to either use precision opamps to amplify the shunt voltages to a range that is compatible to your DAC’s output (e.g. 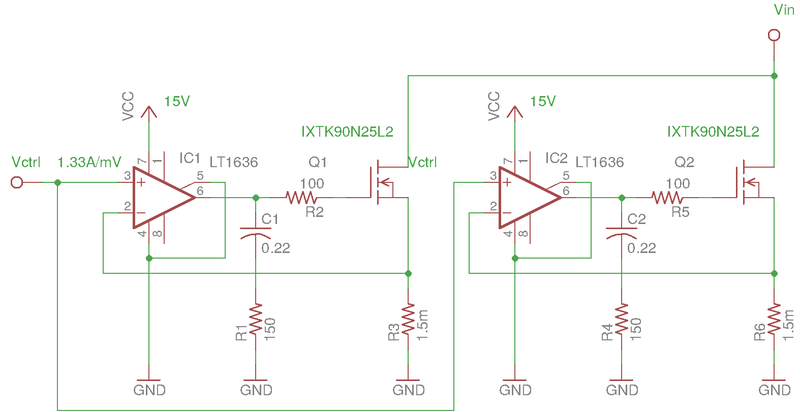 0-5V) or use a low tempco precision voltage divider to generate the mV range control signal. 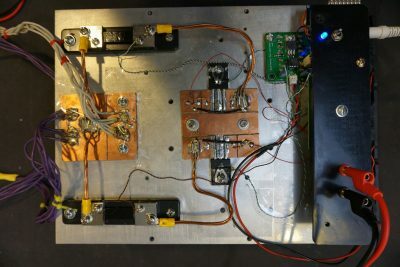 The entire circuit was built on protoboards and placed on top of a large aluminum block. The surface of the aluminum block was polished slightly to ensure good thermal conduction between the TO-264 package and the heatsink. 2oz copper clad was used for higher current carrying capabilities in the high current portion of the circuit. All the wiring on the main current path are done using at least 6 AWG equivalent wires to ensure that they can handle at least 100A without significant heat-up or voltage drop. 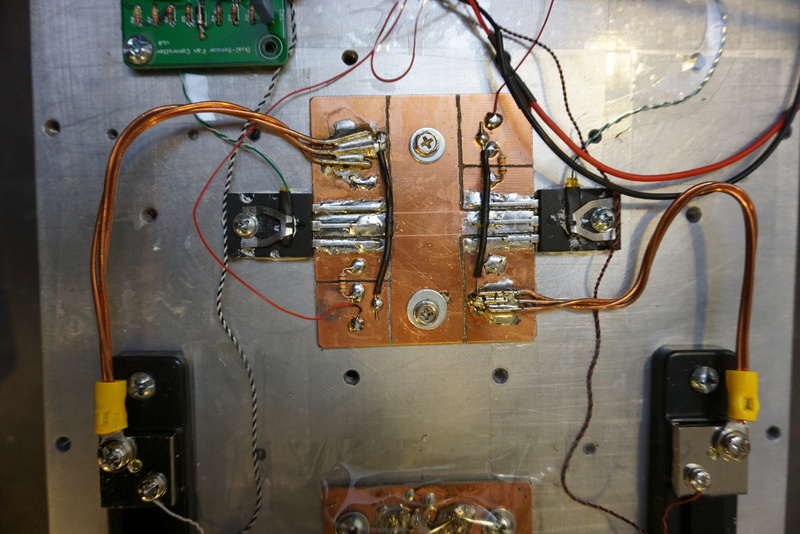 Here is a closeup picture of the two MOSFETs. 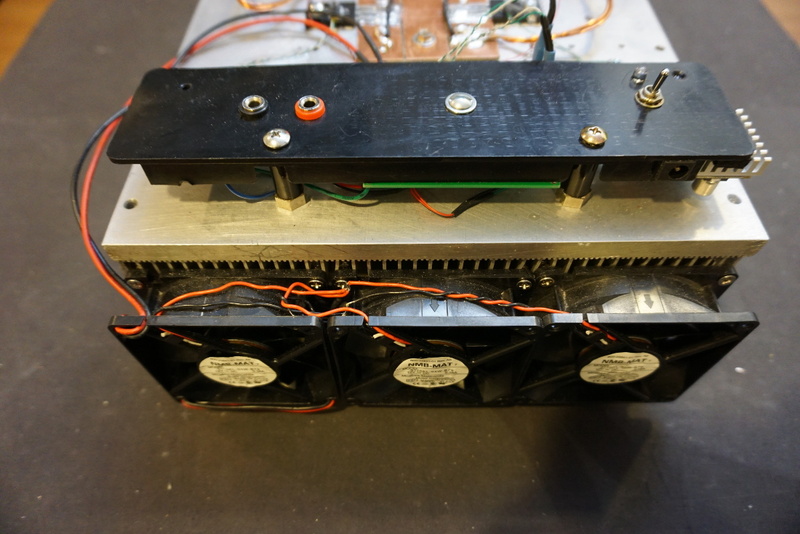 A thermistor which controls the cooling fans is clamped onto each MOSFET’s surface. If you are interested in the dual-sensor fan controller, you can take a look at my post here. Notice that the current shut is wired using 4-wire Kelvin sensing, this is important as the shut resistance is only 1.5mΩ. The following is a picture showing the board that houses the two LT1636 rail-to-rail OpAmps. A DC-DC converter is used to convert the input voltage (15V to 20V) down to 12V for the fan controller circuit and the cooling fans. 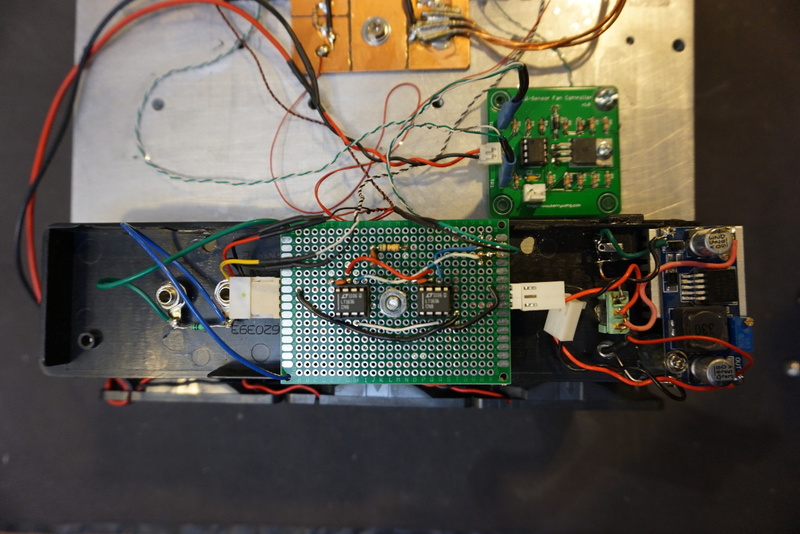 And here is a picture showing the controller board mounted. You can also see three cooling fans on the side of the heatsink. 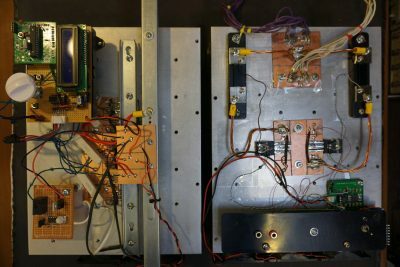 I built an Arduino controlled electronic load back in 2013. That electronic load used six IRF150’s but was only able to dissipate around 150W before one of the MOSFETs suffers secondary breakdown. Here is a picture of both of these electronic loads side by side. Yes, they were built with the same kind of heatsinks. I bought two of those in an auction and now they are both put to good use. In the video below, you will see me testing a 3.3V 80A and a 12V 85A power supply. What about using a couple of high-end CPU coolers for the MOSFETs? Some of the better coolers can dissipate in excess of 300W each…that way you can do away entirely with the very large heatsink and fit it into a much smaller form factor. Granted, they’re about $70 a cooler, but considering the cost of a commercial load of this nature, it’s still cheap by comparison. Very nice and simple design. Does this circuit also work well as a transient load — i.e, if the voltage input is stepped from a lower voltage to a higher voltage? Thanks! It depends on how fast the transient is. These linear MOSFETs are not particularly fast due to their large gate capacitance. Do you see any limitation on paralleling 8 IXTN200N10L2 MOSFFETS, similar to your X2 design, producing 600A with VDS 3-4 VDC. Heat Sink would be cooled using chilled water cold plate. 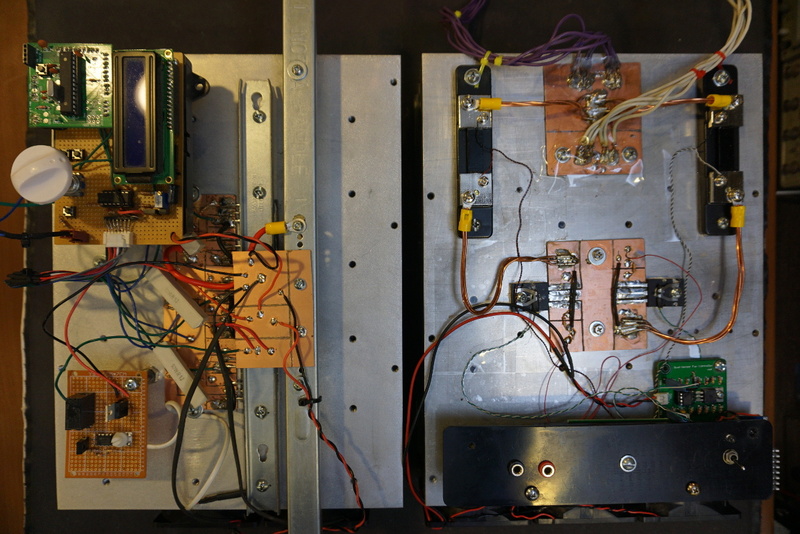 We are building system to test 48V, 500F super capacitors. Charge and Discharge current is 600A. 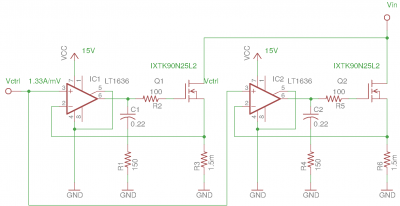 A tracking power supply is used to maintain 3-4 Volts across the MOSFETs. I don’t see any limitations since each MOSFET is individually driven via its own opamp. The main issue is dissipating heat. I was wandering if we give a pulse at the input of the op-amp to drive the mosfet – will the heat dissipation will reduce. It seems there is a weak link between the DUT and the INVERTING INPUT of the Opamp. I have been testing with a DUT source of 0-30vot. Thank you for the nice video and explanation of this design. I have some questions. Is R5 a 100 ohm or 10k resistor? What is the current output of you standard power supply? I am thinking of building this design to test batteries. I will add a voltage cutoff circuit and timer circuit for run time. Am I correct in saying that as the voltage changes the load will change as this is not a constant current load once the voltage changes? Have you doen any designs to this making it a constant current or constant power load bank? I look forward to hearing back from you. Have a great day! I sent you other questions and I will check my work email on Monday. I have a few more questions. Are you using the heat sink for the path of the Vin white cables? Is the ground off of the 1.5moh shunt a separate ground, or are all the grounds tied together? I am planing on using a 15v supply for the VCC of the op amp than dropping the voltage for the Vcrtl with a dc dc converter and voltage divider. R1 of the divider will be a fixed 1% value and R2 will be a precision ten turn pot. Another option will be to use a 1 ohm 100 watt precision resistors in place of the shunts. This way I may be able to use higher ctrl voltage. I will use a voltage divider same principle as before, but no need for the dc dc converter. I look forward to hearing back from you on these questions and my previous ones. Thank you and have a nice day! Yes, my heatsink is not isolated, it’s tied to Vin. I don’t think dropping the voltage from a DC/DC converter for the control voltage is going to work as the noise from DC/DC converter output is very high. Ideally you want to use a linearly regulated voltage source with a resistive divider followed by an OpAmp voltage follower (so the output impedance is low). I have answered your other questions in my email reply. Good luck with your project! Hi Kerry, thank you for the reply and kind words. I figured as much with the DC DC converter. I sent other questions before, but I don’t think they went through. Here they are again lol. 1. Are all the grounds tied together or is the load ground separate? 2. I don’t see in the schematic what looks to be a resistor in fit tubing going from the source to the other end of the gate resistor. What is this and what is it’s value? 3. I see an extra capacitor and resistor located by the op amps next to the red or orange wire. What are these for? 4. You have a resistor across the Vctrl input. I don’t see it in the schematic. Is it needed If yes, what is the value? Thank you again for your time! I am looking forward to building this unit! Yes I did, Thank you! I will be purchasing some parts this week. I am savaging some heatsinks and fans from some old parts that I have at work.I will be drawing up a schematic of the design. Once drawn I will send it over to you if you would like. I am planing on adding some other circuits to it and meters for setup and cutoff. Have a great day! Talk to you again soon! I forgot to mention that the dc-dc converter I was planing on using would have been a low noise converter. That is why I asked. I can get a linear supply for the resistor divider and op-amp. When the design is built I will be able to test it with the 12v 60 sever supplies I saved. Thanks again for your time. Just wondering about the resistors across your mosfets in the shrink tube? And also can I just use one shunt resistor instead of using two of them? I have a 200 amp 75 mV shunt resistor I’d like to use instead of using two 100 amp 75 mV shunts. Look forward to your reply. the resistors in heatshrink are used to discharge the gate charge (1 Meg) so that the MOSFET does not turn on accidentally if the gate is touched. For this kind of high power application, you really want to use separate current shunt for each MOSFET so that the load is properly shared between them. It would be awesome if you could write a bit about how one would choose MOSFETs for this specific application (DC electronic load). I understand that this specific LinearMOS series from IXYS is specifically designed for this application but it may be hard in some areas to get these devices for a reasonable price and I’ve seen that in the other electronic load you made, you used IRFP150N which don’t give a Safe Operating Area for DC operation in the datasheet.